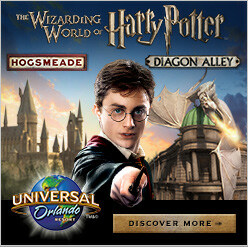 Throughout all of Universal Orlando there are chances to see all types of live shows. 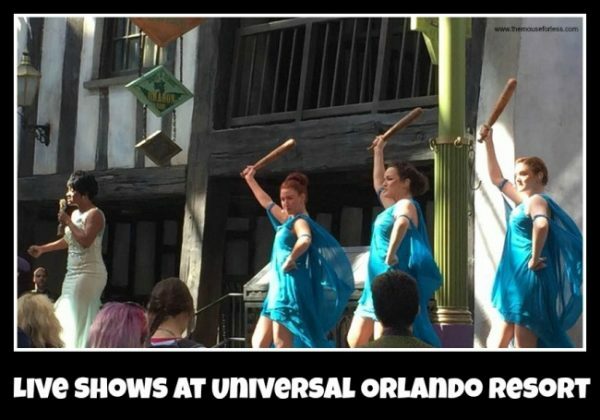 With the various live shows at Universal Orlando Resort, there is truly something for everyone. Animal Actors – On Location! This 20 minute show occurs daily and is great if your legs are needing a rest from a hours of fun. Learn how your favorite animal actors are trained and taught to act on set. You will see dogs, cats, birds, and more! Straight out of Chicago come the Blues Brothers with their soulful musical stylings. Joining them is vocalist and waitress Mabel, and her partner Jazz on Sax. In Diagon Alley witness the musical stylings of Molly Weasley’s favorite singer based on the Harry Potter novels. Come to Barney’s back yard to sing and play everyday with Barney and his friends. 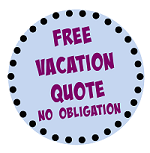 Your children will love it and it gives mom and dad a chance to rest. The 25 minute comedic tutorial learn how some of film’s craziest characters are created. sit and enjoy the indoor venue while you gear up for more park fun! Look no further for danger and excitement than Fear Factor Live. Here you will find dangerous stunts, creepy crawlies and death defying situations. Audience members can participate or just watch in shock and awe! This is a sidewalk show that runs about 20 minutes at a time throughout the day. These guys perform a few different catchy tunes that are sure to liven up your day. Join Nickelodeon superstars in a parade through the streets of Universal Studios. there’s always great music, grand floats, and street performers to get the crowd roaring. Here you will sing and dance with characters like SpongeBob Squarepants and the famous Minions. Presented by the Wizarding Academy of the Dramatic Arts, players portray 2 of Beedle the Bard’s famous tales. The Fountain of Fair Fortune and The Tale of the 3 Brothers are told through scenic pieces, props, and puppetry. Students from each of the houses in the Hogwarts School perform a Capella songs along side croaking companions for a truly unique performance. In Suess Landing famous characters from the Dr. Suess collection tell a number of the authors stories through song. Be sure to stick around after the show for photos and autographs with the characters! In this live action attraction visit the Temple of Poseidon for an unforgettable journey. This show has lasers, pyrotechnics, and water effects to keep you on the edge of your seat. Join the students of Hogwarts in rallying up for the Triwizard tournament against the other two wizarding schools. Witness the infamous Blue Man Group at Universal Studios CityWalk. For tickets call 407-BLUEMAN (258-3626). This recreation of Bob Marley’s Jamacain home doubles as a restaurant and live show. Inside is a full service restaurant, and outback is a party with a live Ragae band plus a DJ. Hard Rock Live presents top musicians and even funnier comedians in a 3,000 seat auditorium. For ticketing information contact 407-351-LIVE (5483). A Polynesian style luau with a pit pig roast, hula dancing, and delicious Polynesian foods. Hosted by the Loews Pacific Resort in Unirversal Orlando. This event only occurs 4 times a year. It is a romantic night of Italian dining and live opera performances at the Loews Portifino Bay Resort. The Loews Sapphire Resort has a Caribbean style. Every Wednesday they do live interactive dinner shows that is fun for the whole family. At the Loews Portifino Bay Hotel you can enjoy a blend of pop and opera classic each night at sunset. They like to call it “Popera”.